A professional swimming pool contractor, Lakeside Pools & Concrete specializes in the design, construction and installation of inground swimming pools. Servicing Windsor, Tecumseh, LaSalle, Amherstburg and Essex County. Also servicing the Greater Detroit Michigan Area. With over 24 years of experience. 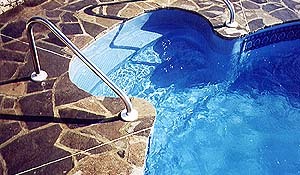 Let Gino from Lakeside Pools and Concrete, design, construct and install your new inground swimming pool. At a very young age, I began to learn the skills of this trade. Having worked as my fathers personal assistant or “runner” I obtained the desire to pursue the concrete and pool business in my teen years. My mentor, my father, instilled strong expectations and quality workmanship which I have carried with me into my career. I continued to pursue my need for knowledge and technique in concrete with a local concrete/pool company. This allowed me to acquire the knowledge and hands-on experience needed. 22 years has passed and I’ve mastered various skills of the trade. But this is an ever-growing industry and I make it a point to attend trade shows and add to my abilities to in order to provide my customers with the most up-to-date materials to produce to quality and creative finished projects. As President of the company, I personally oversee all the work and take an active role in each and every project.